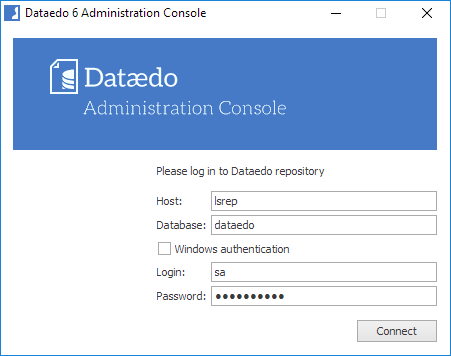 To manage user accounts in a repository you need a Dataedo Administration Console. 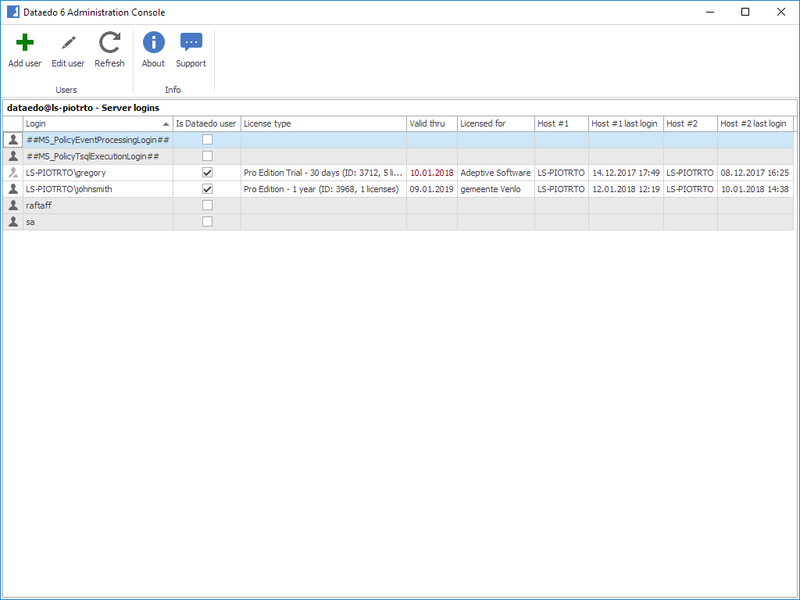 To run the console, choose Dataedo 5 Administration Console from the start menu or run the file named DataedoAdministrationConsole.exe from program installation folder. sysadmin role on the server. When you run the console, login window will open. Type in repository host name, database name and your server admin username and password and click Connect button. Once you log in you will see a list of users. License type - the type of a license for a Dataedo user - it includes a name of a license, unique ID, and a number of licenses the key includes. Valid thru - for time-constrained license keys (trial keys or 1 year licenses) it displays a date key is valid thru. If the license key is expired date will be red. Licensed for - the name of entity license was issued for (provided as License Holder at purchase). Host #1 - host name user logged from (host 1 and 2 are users alternately. User can login from maximum 2 hosts during a day. Check Is Dataedo user field. By default, this user will have a free license key. If you want to enter any license key (Pro or Trial) change License key field to 'Key' and paste key in the field below. Click Save and user gets created. A new User details window will open. Provide login and choose authentication mode. 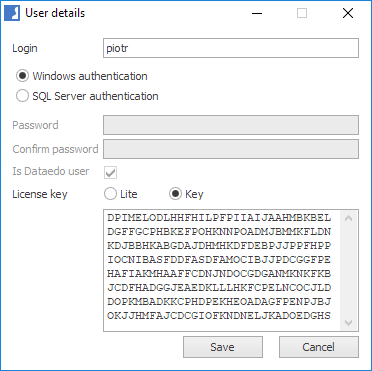 If you use SQL Server mode then you need to provide a password for a user. Type it into both fields below. Note: You will not be able to change authentication mode after user gets created. By default, this user will have a free license key. If you want to enter a license key (Pro or Trial) change License key field to 'Key' and paste the key in the field below. To assign or change a license key for a specific user double click user row - edit form will show. Paste new key into the key field and save with Save button. Every license key has a limit of users it can be used for. When you save key, console checks amount. To remove a license key from a user (you might want to use it for another user), double click user row and choose 'Free' in License type field and save with Save button. 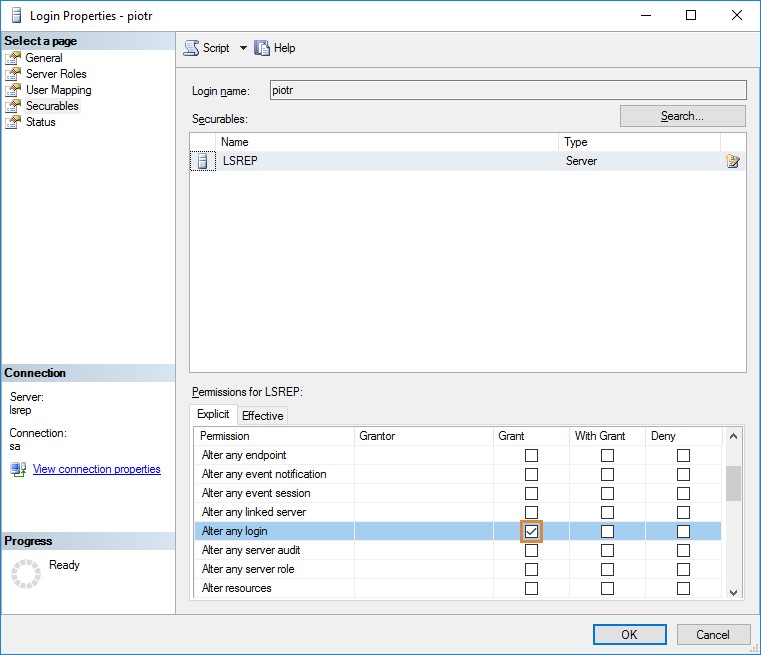 To move license key from one user to another use instructions on removing and assigning keys above. You can check what license type user has in the License type column. To check when the license key expires look at Valid thru column for a date. If the license key is already expired date will be red. 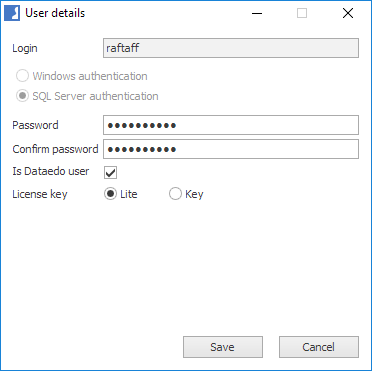 To change the password of a Dataedo user double click user and type in the new password in both password fields and save with Save button. Note: this option is available only for SQL Server authentication mode. 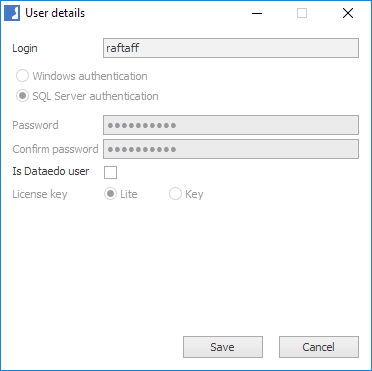 To remove Dataedo user from the repository double click existing user and uncheck Is Dataedo user fields and save with Save button. Note: Only Dataedo user will be removed - the user will still be defined on the server. 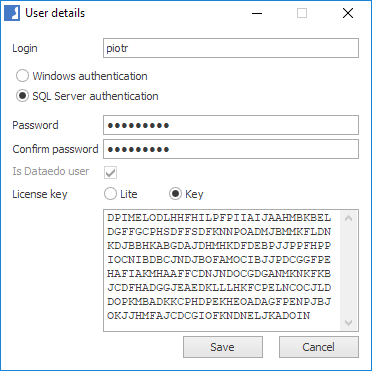 To remove SQL Server login use SSMS or contact your database administrator. 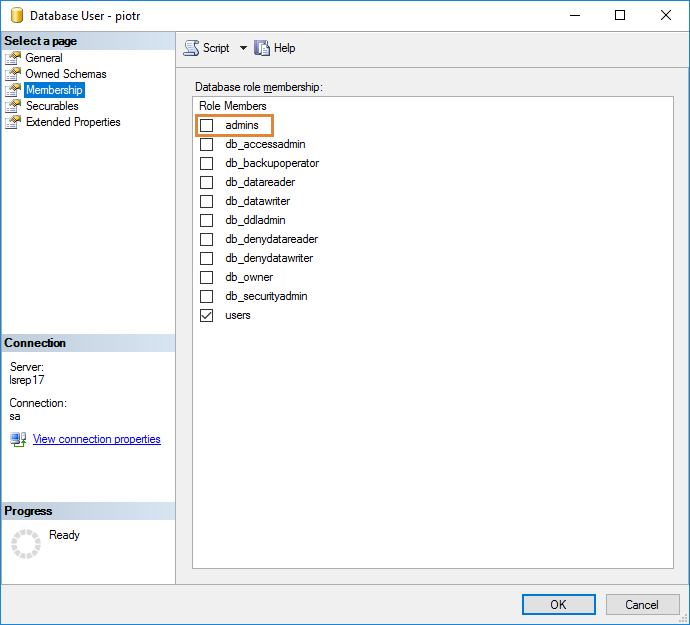 To grant the user an access to the Administration Console you need to assign it admins a role in the repository database. 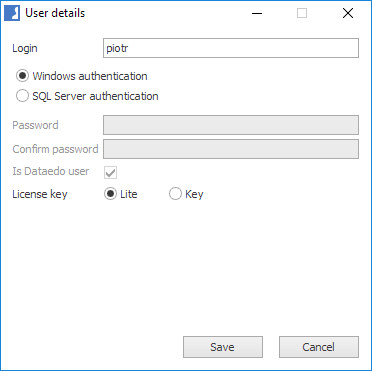 To grant the user a permission to create new users (logins on a server) user requires alter any login permission on a server. There are no comments. Click here to write the first comment.